Equipped with bows and spears, these men are able to provide an army with ranged support while still capable of quickly switching to light spearmen. 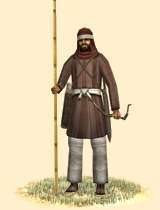 These lightly armored Arabian archers are versatile troops. Equipped with bows and spears, these men are able to provide an army with ranged support while still capable of quickly switching to light spearmen. The versatility of these troops is their main advantage, however, and they should be expected to hold out for too long in a melee against a disciplined opponent. Historically, the settled and wandering tribes of Arabs and Bedouins North of the Sabaean heartlands were a sporadic source of troops for the larger kingdoms of the South. Despite a thin and widely spread population, these troops formed a substantial component of the Sabaean irregulars, and were organized quite ingeniously. The Sabaean King, and High Priesthood in regions with sympathetic religious practices, organized small tribal councils to administer the levying process within particular territories, during which even their less organized troops could be trained and equipped to greater effect.